9914 S Old Oregon Inlet Road, Nags Head, NC.| MLS# 103607 | Outer Banks Homes For Sale, North Carolina Home Search Including Nags Head, Pirates Cove, Manteo, Kill Devil Hills Kitty Hawk, Southern Shores, Duck, and Corolla North Carolina, Oceanfront and Soundfront properties for sale and long term rentals. Ocean to sound views makes this home the best of both worlds. Seller's favorite moment is seeing the beautiful sunrise and sunset from the top of the world at this tucked in private location backing up to the National Seashore. Nothing spared with the 2016 renovations in this reverse floor plan home that shines with owner pride. Turn key condition and renovated and in mint condition. This spectacular home offers a view from the rooftop deck that will take your breath away. Offering a reverse floor plan to maximize the views. Drive into the carport with access to a lower enclosed entry. A few steps and you enter into the hallway that leads to a great oversized master bedroom with walk in closet. Master bath has large custom walk in ceramic shower accented with black cabinetry and granite countertops with all new ceramic floors and finished with custom blinds. The second bedroom has a built in white raised panel cabinetry and offers a full size Murphy bed or can me also used as a office with a desk to be used if you want to work from home. Flip from desk to bed with out closing your computer. Conveniently the laundry closet with washer and dryer and hot water heater so all mechanicals are inside the home as easy to use near the bedrooms. Hallway bath offers new vanity with granite tops and fiberglass tub/shower combination. 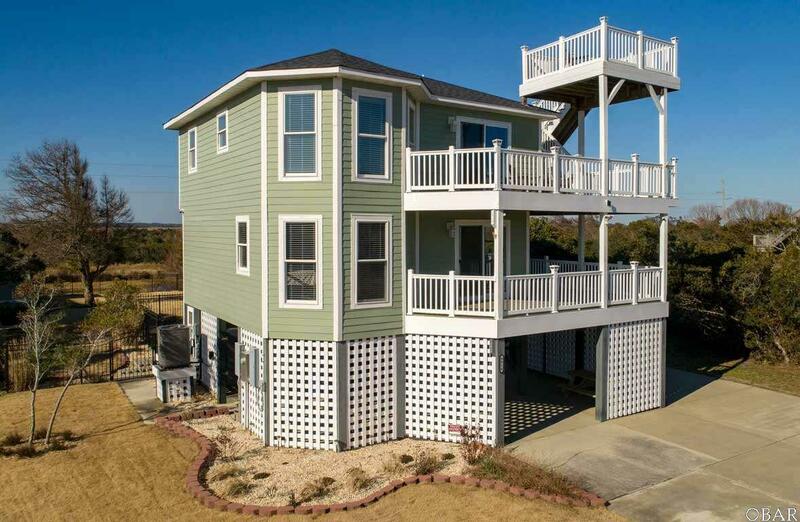 Upstairs you have ocean views from the main living area that has a sliding door to the east open decks. The living room offers beautiful wide plank hardwood floors with views of the ocean. Kitchen has beautiful custom solid wood cabinets with ceramic backsplash with all new updated black appliances which include refrigerator with ice maker, micowave, dishwasher, and range/oven finished with awesome granite countertops and ceramic floors in the kitchen. The third bedroom is off of the main living area with views of the sound with bath in the hallway to service the third bedroom, offering walk in ceramic shower with custom solid wood vanity finished with granite countertops. Extras include on exterior of the home a roof top deck to enjoy the splendid sunrise to sunset capture with morning coffee or afternoon beverages. All of this awaiting you and your family and friends to enjoy. Large 19869 square foot lot that is tucked in backing to the National Seashore. Property is privately located off of beach road. The level lot offers an outdoor utility building for additional storage and a fenced in area with black aluminum railed fencing. For added outdoor recreation the property offers an in ground saltwater fiberglass pool. Renovations include, new roof in 2017, siding, decks with white vinyl railing. Inside this beautiful home you will also find custom hardwood stairs, painted wainscoting, new light fixtures and plumbing fixtures. Property is alarmed and owner in so appointments will need to be made in advance. Seller has completed a home inspection and will share feedback with buyers. Seller welcomes home inspections but has completed one prior listing. Seller's believe their home to be in absolutely excellent condition. Home being sold in"As Is"condition. Village Realty Rental Projection, Survey in file. Insurance costs and declarations on file. Seller selling unfurnished with exception of appliances and built in white cabinetry /Murphy bed.